In keeping with our care package theme this week, I've got another one for you today! One of the best places to receive a care package is in your dorm room at college. Now that it's nearly October, all the college students should be settling in to their semesters. It's the perfect time to send a little package full of love and encouragement. This package is geared toward the college girl, of course, but I'm sure you could substitute some things if you have a boy instead. Now let's talk about the contents. A good, reusable, leak-proof water bottle is an excellent thing for a walking campus. A college student needs to stay hydrated! For dorm room snacks, it's best to have a disposable container. We all know how annoying doing dishes is, and if there's no kitchen in your dorm room, it's even worse! This is great for ordering text books, but if your college student has Amazon Prime, then it's good for ordering...basically anything at all. Great for a movie night with the roommate and neighbors. I think college is an excellent time to experiment with beauty and skin products. This is important, especially if your student is taking math classes. I love to take notes in pen, but tests and exams require pencil. Make sure that the mechanical pencils you buy, though, have lead that's equivalent to #2 pencils...that way, if their school gives mainly Scantron exams, your favorite student won't have to continuously sharpen a wooden pencil. 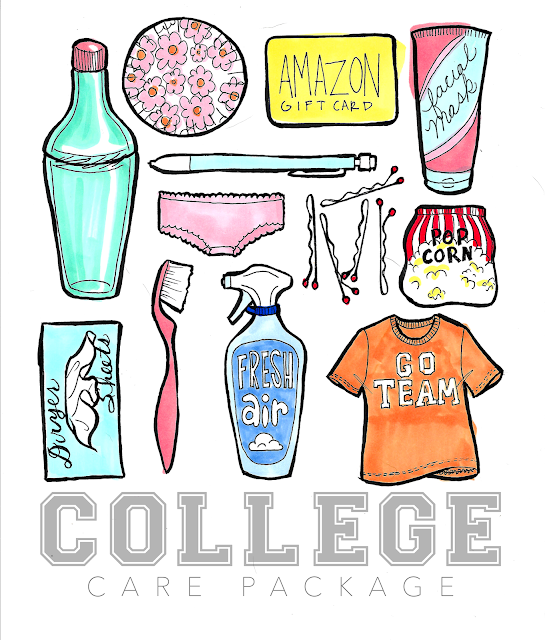 This may seem like a weird thing to include in a care package, but if your student is having to do their laundry on their own for the first time in their life, then they will appreciate all the undies, towels, and socks they can get. I feel like college was a really bobbi pin-intensive time for me. And, as we all know, bobbi pins disappear more quickly than matching socks. So, a new card of bobbi pins is alway welcome. When I lived in the dorms, it seemed like almost every night, someone burned a bag of popcorn. But popcorn, because it can be cooked in a microwave, is a perfect dorm room snack. My freshman year friends and I used to all gather around to watch the newest episode of Law and Order: SVU every week. Just imagine how often students must be gathering for their favorite shows now, in this golden age of television. Yes, another laundry item. Chances are, your college student isn't buying dryer sheets. But they make such a great difference in the smell of their sheets, towels, and clothes. Additionally, these are easy to ship because a box of them is so light. It's always good to switch out your toothbrush. Keep an eye out for a nice one in an interesting color and include it in your package. Your student is living in a dorm around a bunch of people who haven't been away from home before. I feel like air freshener is necessary. College and vacation are perhaps the only times wearing clothing with the name of the place you actually are is appropriate. A good college hoodie or tee shirt can last for years after college. I know I've had one of mine for at least ten years. So, go ahead, get their collection started - or add to it. All right. Happy Wednesday and happy shopping!